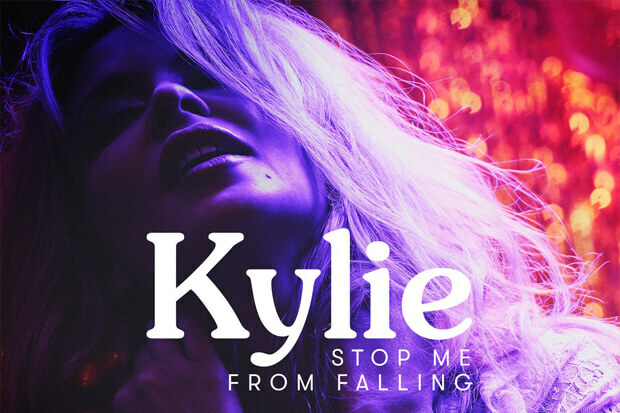 Kylie Minogue Announces Release Date Of "Stop Me From Falling"
Things are getting serious for the Goddess of Pop. Today (March 8), Kylie Minogue announced plans to unveil the second single from her forthcoming Golden LP. Called “Stop Me From Falling,” the release is dropping at 8:10 GMT, and the 49-year-old revealed that she was stopping by BBC Radio 2 to run the premiere. “So happy to announce the second single from my new album Golden – STOP ME FROM FALLING.  I’ll be celebrating and giving the track its first spin tomorrow with @achrisevans on @BBCRadio2 from 8.10am,” she wrote on Twitter. The tweet also included the single’s vibrant cover. Shot with an ultraviolet filter, Kylie poses in a lace top. Delivering a passionate look and with a magenta background, it is definitely one of her most visually striking covers in recent memory. We do not know much about the track yet; however, fans in Cuba spotted the Australian icon on the set of what appeared to be a video shoot last week. Cuban group Gente de Zona are alongside her in some fan pictures from the set, which implies they may have teamed up with her either for the track or a remix of sorts. We’ll have to wait and see when the single drops! “Stop Me From Falling” follows the project’s countrified lead single, “Dancing.” After a performance on Ant & Dec’s Takeaway, the single is still getting set on radio, but it shows some signs of becoming a sleeper hit. If Kylie plays her cards right, she could ride into the release of her 14th LP with two singles climbing the charts across the globe. The pint-sized diva will have plenty of opportunities to perform the hits moving forward. In the last few weeks she has announced a string of shows including a tour across the UK and Ireland and a headlining spot at New York City’s Pride Island alongside Tove Lo. Check out her announcement and the bold single cover below while we wait to hear it! Are you ready for the second taste of Golden? Let us know below, or by hitting us up on Facebook and Twitter! Kylie Minogue's 10 Best Single Covers: From "Got To Be Certain" To "Into The Blue"